The septic tank inspection regime is in place for almost a year now – but faded from the headlines! Here’s an industry view on what has happened. 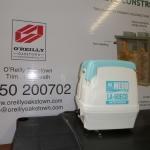 Diarmuid O’Reilly, managing director of O’Reilly Oakstown, which manufactures the award winning BAF range of sewage treatment systems, has spoken to the Farmers Journal this week. * The targets set are quite low, ie 1002 inspections per year for the WHOLE country. Quite honestly this is a little unambitious, given the numbers of septic tanks in the country, as it could conceivably take up to 480 years to complete the programme, assuming there is a moratorium on one-offs for the next half millennium. * Secondly, while many counties have stepped up to the mark including Limerick, Meath Westmeath, Louth and Wicklow, some had yet to start by the report date. That included Clare, Donegal, Leitrim and Offaly. * So 423 inspections have been carried out. Of these 224 tanks failed for one reason or other, equal to 53%. Reasons given included leakage, unlicenced discharge, ponding, roofwater getting into the tank, lack of desludging, risk to health and operational/maintenance issues. * Of the 224 advisory notices issued, only 27 had been resolve and closed off. That’s an average of one septic tank per county whose issues were resolved! Ensuring the country’s septic tanks are working properly is going to be a slow, long drawn out process! * However, this may change as the councils get to grips with the inspection regime. My thoughts on this, and speaking purely from a commercial point of view, is that the new regime is having no positive effect on sales and installation of new septic tanks and treatment systems and work for groundwork contractors, despite the existence of a grant of 80%, up to a maximum of €4,000 for those on incomes under €50,000 and €2,000 for incomes above this threshold. In actual fact, it is having a negative effect as homeowners would understandably be reluctant to pay full price for upgrading their septic tank if there is is the slightest chance of grant-aid should they be inspected. And it is a very slight chance. In any one year there is a one-in -480 chance of being inspected, condemned and grant aided. There are 479 chances of not being inspected. This is distorting the market for new septic tanks and sewage treatment systems. As much as some people want and may badly need to improve their system and possibly take advantage of two glorious summers to do so, they are restrained by the prospect of easy money and a waiver from planning permission. One thing to realise is that this regime is not a money making scheme for local authorities, far from it. In fact, it is a drain on their resources, which is not reimbursed from central funding, as far as we are aware. Since the announcement that grant aid is available after inspection, should ones’ septic tank or percolation fail, public opinion has gone from initial resistance to inspections to openly welcoming them in many cases. Self- generation of inspections is not allowed, however, as county councils insist that they are strictly randomly generated. While the inspection of existing septic tanks will be a slow process, a lot of progress has been made in raising the standards of sewage treatment for new-build houses. Gone are the days when the septic tank was an afterthought, often cobbled together from a couple of well liners followed by a perfunctory “soakhole” filled what ever rubble was left over from the build. Now the treatment of sewage is the primary consideration. In other words, if you cannot percolate- you cannot even begin to plan to build. This is to ensure that, whatever type of system is installed, the final effluent can be dispersed effectively without posing a risk to health or property. The current regulations for single house on-site sewage disposal operates in three distinct stages. Planning application/ system design stage: This is largely dealt with in the Department of Environments Code of Practice 2009 (CoP2009). It ensures an effective treatment system and percolation area / polishing filter is part of the initial planning of any house. Construction / certification stage: The septic tank / wastewater treatment system must comply with part H of the Building regulations 2010. Furthermore the installation and percolation area must be in accordance with the design granted at planning stage. Put plainly, this ensures that what is planned for is actually built. That protects the homeowner. Operation / Maintenance stage- The Water Services Amendment Act 2012 sets out the responsibilities of an owner of an on-site sewage tank/system. All this and more can be found on the website of the Irish Water Treatment Association- www.IWTA.ie. The IWTA is dedicated to raising standards and ethics in effluent treatment, something which is critically important when you consider how long you expect a wastewater treatment system to serve a house, ie a lifetime! You can change a cheap washing machine or dishwasher relatively easily when it fails, however a bargain basement sewage treatment system would be costly to replace. Another welcome development is the Home Renovation Scheme which offers tax relief to homeowners for home improvements. One of the areas covered under this broad scheme is repair or replacement of a septic tank, provided that it is the homeowner’s own house. Take an example. A home owner pays €3,500 plus VAT for a new treatment system and another €1,500 for the related groundwork, both VAT rated at 13.5% and both companies tax compliant. The homeowner can reclaim €675 against future taxable income, calculated as €3,500 + €1,500 x 13.5%. While, in this case, the saving is less than the grant available under the NIP grant scheme, it is available to everyone. It can also be combined with work by other contractors on a house to a maximum of €30,000, giving a tax saving of over €4,000. In addition it allows the homeowner take control of when they wish to do the upgrade work, rather than waiting – or hoping – for an inspection! So, some good news for homeowners for once!